Rebuilding Place in the Urban Space: Wall Street Journal special section, "Future of Cities"
Wall Street Journal special section, "Future of Cities"
Yesterday, the Wall Street Journal published a special section of articles on "The Future of Cities," which is a feature section they run a couple times each year. -- "How Driverless Cars Are Going to Change Cities"
-- ">AI Aids Natural-Disaster Response"
It's worth trying to find a printed copy. 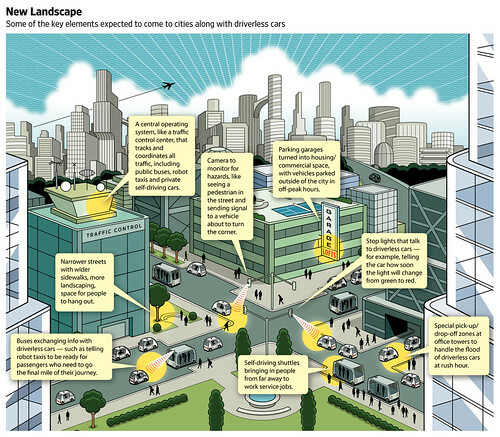 This is a diagram from the driverless car article. Charlie and I were discussing these types of diagrams in the context of what I call the "Sustainable Mobility Platform," and this is a good example, although it focuses on the impact and changes necessary to accommodate driverless cars, it's more about mobility and infrastructure as an interconnected system. Wall Street Journal graphic by Peter and Martha Hoey.